Beacon Press: Whose Vote Counts? In Whose Vote Counts?, Robert Richie and Steven Hill listen to what the silent are saying. They argue that we need a new way of electing our representatives to combat voter apathy and the leveling of political views. 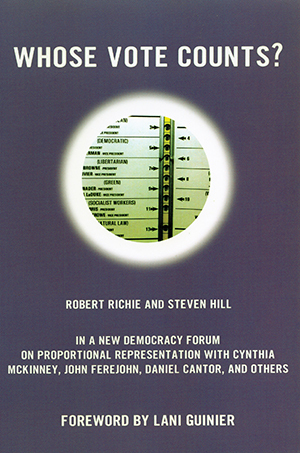 Such a system already exists in many parts of the world, including places in the United States: proportional representation. Leading activists respond in essays that illustrate what our country could look like if all qualified citizens became voters, and if they all felt their vote contributed to more than just the winning or losing tally.